One of the many advantages of traveling is the opportunity to try new and different experiences, in this case beer. Yeungling is one of the few breweries to survive the consolidation in the middle of the last century. Not available in Illinois, and only recently in Ohio, they produce a number of Lagers and this Black and Tan mix. Nothing super fancy but not a bad beer. Well, Dark Lord Day 2010 is complete and it was a great experience. 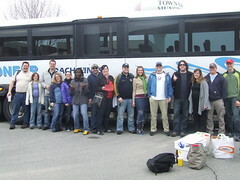 We traveled to Munster, IN via a full size bus for the event. We were only supposed to get a 15 passenger shuttle, but the transport company ran out so they upgraded us. It was a great experience and the weather was just good enough to make the day enjoyable. As the first DLD for both Erin and I, we didn’t know exactly what to expect and learned some lessons for next year. On the bus, no one will want coffee. Bring local beers. In line, no one will want muffins. Bring local beers. Once in Munster, you will want food. Bring local beers a grill. Erin and I decided to take advantage of the thousands of frequent flyer miles and tons of Hilton points (some from me, most from her) we have accumulated over the past few years and spend some time in Northern California. It was nice for a four day weekend, and for those of you that may be interested (I have no idea why) I have included some details below. Day 1 – San Fran and Drive to Elk Cove Inn – After arriving at about midnight the night before, Erin and I drove Highway 1 all the way up to the Elk Cove Inn in Mendocino County. We drove by the Twit Cottage (I think) when we went through Petaluma but we didn’t go in. Maybe next time we will email for a visit. We spent some time at the beach and enjoyed our first set of afternoon cocktails at the Inn. We finished the day with an decent dinner at the Bridget Dolan’s Pub. Day 2 – Elk Cove Inn and Relaxation – We had a pretty laid back day with a hike through Van Damme State Park and the Pygmy Forest. We had a brief visit to the Spa and then enjoyed afternoon happy hour at the inn (detecting a trend here?). We had dinner that night at the Greenwood Pier Inn. The company and the food was excellent but the service at the Inn is just brutal. A great meal with pretty bad service, but the pickings in Elk are a little limited so your hands are tied. Day 3 – Elk Cove Inn – Since we were in wine country, we figured we should finally visit some wineries. Based on the recommendations on some people we met, we visited the Greenwood Ridge Vineyards. It was a really nice winery and their Mojo is a great ta ble wine, I only wish you could get it in Chicago. Also, based on the recommendation of one of my clients/friends, we visited the Husch Vineyards. It is a beautiful place and it was well worth it to have to check our luggage to be able to take some bottles home. Somehow, we also managed to include a visit to Glass Beach in Fort Bragg. The pictures we took were amazing and got some great macro shots of the “sand” and some really cool shadow pics of Erin doing yoga . We finished with dinner at the Greenwood Pier Inn mainly because it was the only location open in town and we didn’t want to drive after coming within 10 yards of hitting a deer while driving back. Day 4 – Back to San Francisco – We took a leisurely drive back to San Fran and spent some time on the Fisherman’s Wharf. We had a nice lunch at Boudin and saw some of the BBoys doing their break dancing (see the YouTube Video). It is sometimes nice to be tourists for a change. After a late flight, we were back home in Chicago by the ripe old hour of 2AM. Whew! See our pictures on Flickr and the video of the BBoys on YouTube. Wrapping up the planes, trains, and automobiles of our Thanksgiving holiday. We had a lovely dinner hosted by my sister Kathy on Thanksgiving day in Ft. Wayne. On Friday, we flew to Memphis and spent the weekend with Erin’s parents. We are heading back to Chicago on an early morning flight to get back to the “real world”. See all of you soon! Well, it appears that I am partially reliving the life of my grandparents on my father’s side. Erin and I just went on vacation two Glacier National Park (see posts below) and we had a really good time. How this is related is that at Christmas time, we came across a number of slide reels of my grandparents that I got scanned at Costco and posted on my Flickr site. I am still trying to organize them all because somewhere in the last sixty years the order of the slides got messed up (most likely at Costco) but it is weird that in the pictures, I found a number that my grandfather took that are almost exactly the same as what I took. For comparison, look at the picture in this post, and then look at the picture my grandfather took 50 years ago. Website of John Telford from Chicago, IL.